Big Finish: Doctor Who - CRISS-CROSS Review | Warped Factor - Words in the Key of Geek. Tony Fyler gets his wires crossed. Not knockabout, silly fun like The Mask of Tragedy, but engaging, World War II spy thriller fun at Bletchley Park and underwater, but with a fairly standard 80s Who episodic structure. The idea, as shown on the cover, of the Sixth Doctor doing a Sherlock Holmes and dressing appropriately to his situation, ditching the paint-swatch coat for tweeds and a bow tie (Six’ll get you Eleven in this environment) is delicious. The idea of him taking up residence at Bletchley Park to indulge in a little code cracking of his own when the Tardis blows like a cheap lightbulb is both thrilling and intensely dangerous. And the trappings of the story – code-crackers, capable, unflappable WRENs, spies, double-agents, Nazis and British officers all trying to unravel the mystery of a set of golden eggs (yes, almost literally) create an atmosphere that drips with intrigue and suspense. It’s a great environment in which to inform us about the Sixth Doctor’s latest companion, Leading WREN Mrs Constance Clarke, who is that particularly wartime thing – a young woman toughened by circumstance into a capability that belies her youth, a somewhat proper person who’ll stand for no nonsense on her path to Getting Things Done. It’s an interesting combination, a million miles away from the ostensibly younger companions like Mel and Flip, with more in common with Donna Noble or Maggie Stables’ Evelyn Smythe (who Colin Baker has described as his Doctor’s perfect companion). In terms of the traditional storytelling structure, Matt Fitton plays this story with a suitably straight bat, with mysterious codes, double agents and double-crosses setting the pace in the first couple of episodes, before the alien element first makes its presence really felt. Without overplaying the similarity, there’s a resonance to the Twelfth Doctor’s Boneless in the second half, as the Doctor tries to make meaningful contact with the alien. There are reliable idiots who try to shoot things they can’t understand, and without ever delving too deep into the characters’ backstories, there’s enough meat on all their bones to make them more than sketches for the purpose of telling this story – Fitton’s always a strong characterizer, and here he adds another prop to his reputation in this regard, giving actors like Alistair Petrie, Paul Thornley, the ubiquitous Hugh Fraser Charlotte Salt and of course Miranda Raison as Constance more than enough to play with to realise their main roles. We say main roles because it’s not until you read the cast list that you realise that almost everyone in this play does at least double duty, and in some cases take three or four roles. The fact that you have to read the cast list to realise that is a tribute to how well they do the job, and the involving, well-paced plot of this story. What plot is that? Fitton does a glorious cut-and-shunt job of two of the best wartime movie sub-genres – the spy thriller and the submarine drama. Welding the two together is the mystery of a set of golden eggs, which may well not be from around here. The characters that make the story work are manouvred naturalistically from place to place and genre to genre, and we’re in phase three of the story by the time the traditional Doctor Whoness of aliens, a war beneath a war, the Doctor trying to cool heads and deal with the possibly alien presence without completely unravelling the threads of history as we know them really takes off. It takes a skilled writer, a strong cast and a director with a light hand on the tiller to get that dynamic right – the Doctor being part of events, but not necessarily the driving force until no-one else can be – and still maintain the sense of it being very distinctly a Doctor Who story. Fortunately, Fitton’s well practiced, Ken Bentley’s on strong form in this story as director, and the characterization allows the actors to play full, rounded characters with their own motivations, while Bentley keeps the pace tight, and allows the atmosphere to shift as needed – from the military-academic industry of Bletchley to the claustrophobic sweaty uncertainty of the submarine as it finds the owner of the golden eggs. The ending owes a little something in tone to the Counter-Measures audios – as one final double-cross catches some characters unawares, and Constance joins the Doctor to let the bureaucratic – and potentially fatal – shenanigans pass her by. Miranda Raison of course had a particularly complicated introduction to the Sixth Doctor’s life, and to listeners, having appeared in the first episode of the recent ‘Last Adventure’ fully formed and already travelling with the Doctor (and having successfully whetted the appetites of listeners in that story). Here we get a chance to take her back slightly and find out who Constance Clarke is when the Doctor first drops into her life. She more than lives up to the promise of the character who anchored The End of the Line, and if anything after this story she feels exactly as she should feel – more grounded in a backstory, more real, and as though she makes more sense now we’ve been formally introduced. 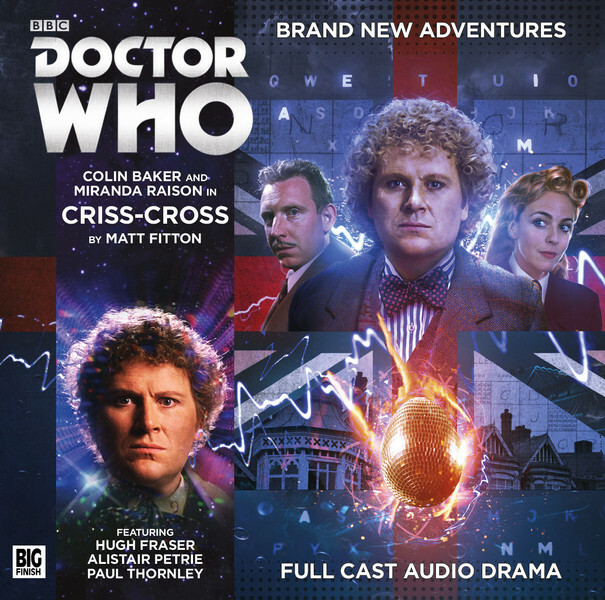 Criss-Cross is an absorbing audio that you’ll want to get to the end of, but won’t want to end; another great arrow in Matt Fitton’s quiver, and a great retroactive introduction to a new companion for Old Sixie – one who shows early promise of going on to be one of the all-time greats.